ManualCorrect is a hack that removes the stock auto-correct feature and replaces it with more user controlled auto-correct. Basically, the stock auto-correct automatically changes some of the words that you type (which can leave for some interesting emails and messages!) 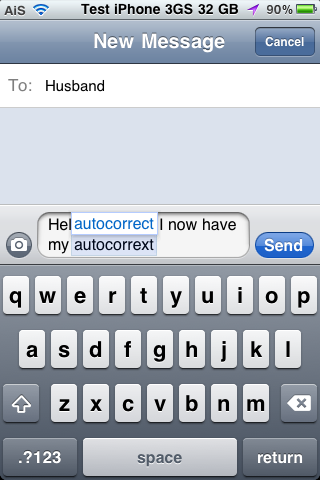 where ManualCorrect removes the stock auto-correct feature and puts in it’s place the option to choose a correction. 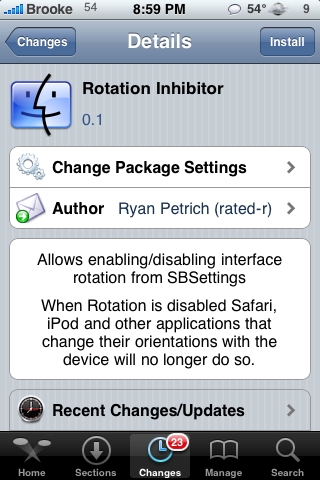 DirectControl is a mod that allows you to go directly to the iPod controls in the multitasking dock. Normally when you double-tap the home button to bring up the multitasking dock, it brings you to the first application in the dock and you have to scroll to the left to get to the iPod controls. 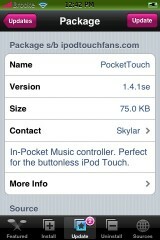 Well, with this mod, you are brought directly to the iPod controls and then can scroll right to see the apps. 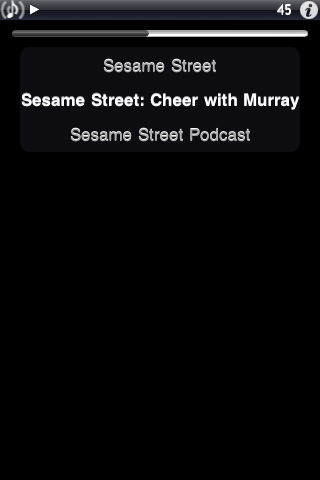 I also like that you can choose to go directly to the iPod controls all the time or only when music is playing… a nice little feature. 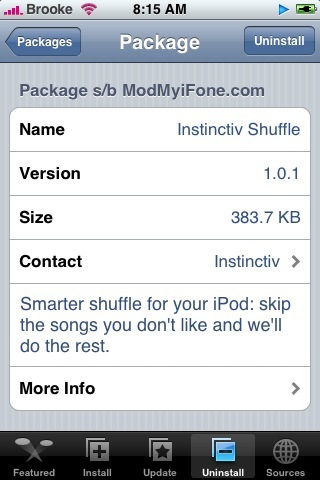 Overall, a simple but useful mod if you use your iPod a lot. You can get DirectControl via the BigBoss source. Check out the Application Description below for more info about the app. • Settings are located in the stock Setting app. Voice Control – What Does it Actually Control? If have an iPhone 3GS then you are probably aware of the new feature…Voice Control. 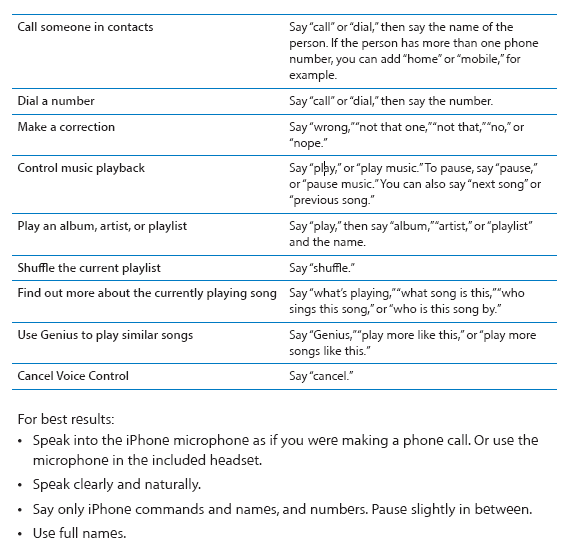 Voice Control is a feature that allows you the user to use spoken commands to make a phone call or control the iPod. That is fine and dandy and all but, what are the actual commands! It is hard to tell your iPhone to do something if you don’t know that what to tell it. You can activate Voice Control by pressing and holding the Home Button on your iPhone. You can also activate it by pressing and holding the center button on your iPhone headphones. Once you hear the beep…you can start commanding. Below is a list of the available commands. 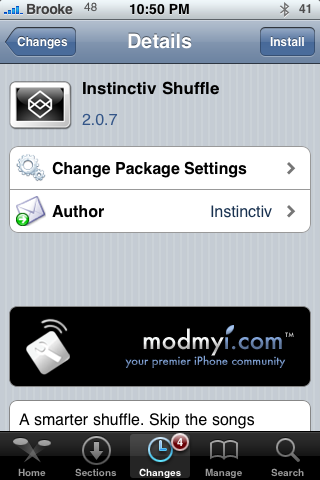 SBSetting Volume MC is a SBSettings toggle that turns your volume control into iPod controller. Once installed, the app is added to SBSetting (you may need to go into the More/Set Toggles options and turn it on). When it is activated, it turns your volume control on the side of your device into a controller for your iPod allowing you to scroll through your songs. 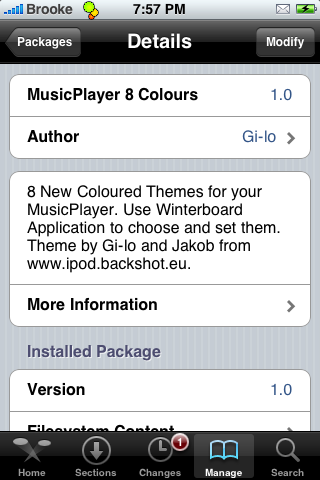 The MusicPlayer 8 Colours mod in Cydia is a mod that changes the color scheme of your iPod. There are eight colors to choose from; Yellow, Silver, Red, Pink, Green, Gold, Blue and Black. It actually is a pretty decent mod. 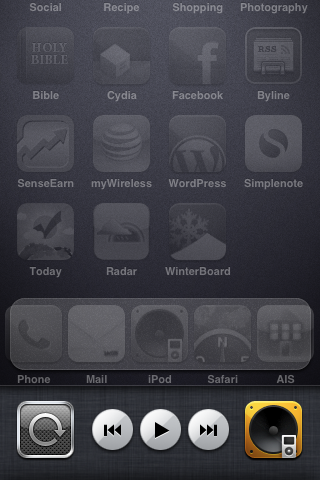 Most themes do not mod the iPod so this could give your current theme a little boost. The only thing I do not like about the mod is that it changes you iPod icon which will overwrite your current theme’s iPod icon. However, you can fix this by moving your theme above the MusicPlayer mod in WinterBoard. Check out the screenshots below. Apple announced the release of the new iPod Touch today. They are now shaped more like the iPhone with the curved back but are made out of stainless steel instead of plastic like the iPhone. They also come with volume control buttons which goes along nicely with the new internal speakers. Another huge feature for the iPod Touch is Nike+ integration. 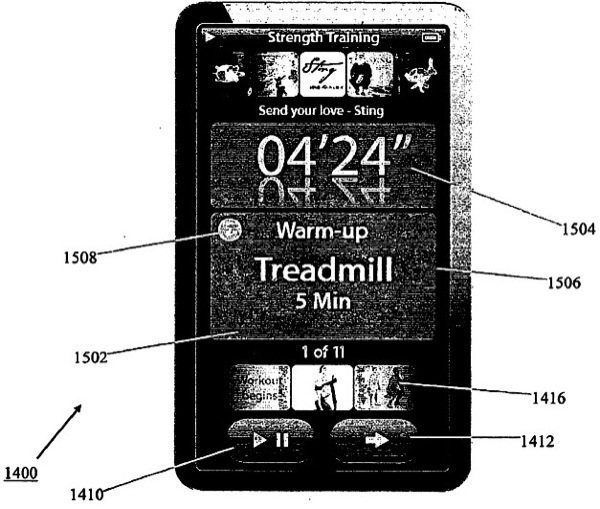 Nike+ is a combination of a sensor on your Nike shoes and software on the iPod that integrates your running and music. 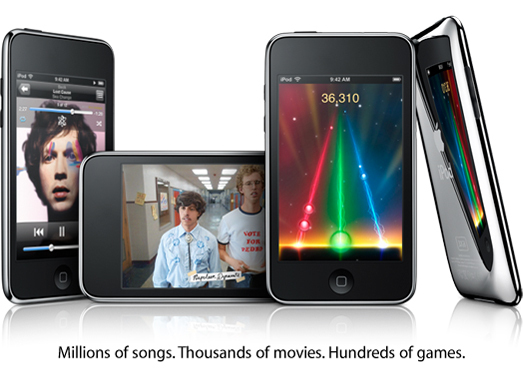 Rumors are, Apple is trying to dump stock of iPod Touches to get ready for a newer version. What will the new version bring? Larger storage, microphone, speaker, camera, GPS? The refurbished prices are $199 for an 8GB, $299 for a 16GB, and $429 for a 32GB. You can pick one up at Apple’s Website. If you want more than just a rumor, many iPhone news sites are reporting the new 2.1 firmware has referance to the iPod Touch as “iPod2,1”. 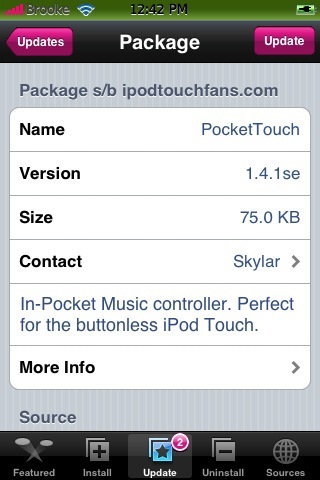 Currently it’s refferenced to as “iPod1,1”. Even better, the iPhone 1st Gen was referenced to as “iPhone1,1” and is now “iPhone1,2” for the iPhone 3G. You can see it was the second number that changed. With the Touch it’s the first number that changes. Let us know what you think all of this means in the comments. The update to version 1.41se of PocketTouch “pays more attention to the way it looks.” I’m not exactly sure what that means but, I did notice the that transition from the Information menu to the main screen has changed…I like it, it makes me laugh. Try it…I guarantee it will make you smile! I also noticed a two other small visual changes; when you pause a song, the play icon is no longer displayed at the top and when you are in the menu the song and artist are displayed at the bottom of the screen. Though, those could have been there before and I jsut didn’t notice them! Skylar, let me know in the comments if I missed something. PocketTouch is available through the BigBoss source.